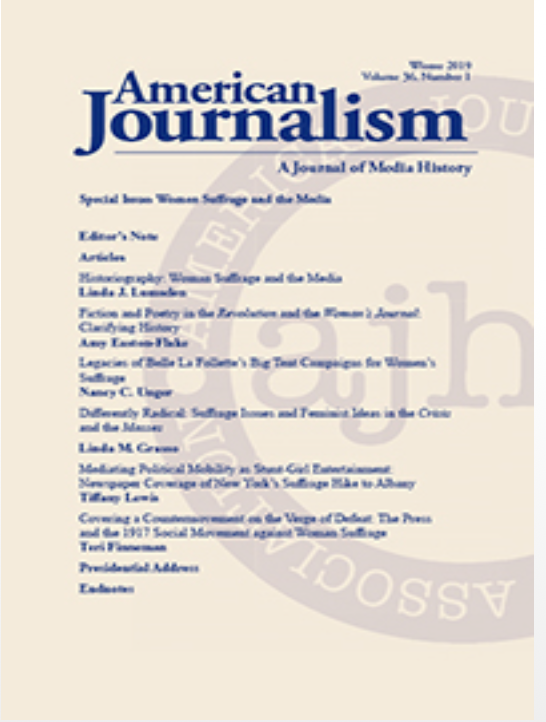 Brooke Kroeger was the instigator of “Suffrage and the Media” the 2019 Special Issue of American Journalism, devoted to new research about the suffrage movement and its relationship to media. The project, begun in March of 2017, timed its completion to coincide with the national centennial celebration of the passage of the Nineteenth Amendment to the US Constitution in 1919 and its ratification in 2020. Below is the table of contents to the issue with the links to Kroeger’s editor’s note, and the articles by Linda Lumsden, Nancy C. Unger, Linda Grasso, Tiffany Lewis, and Teri Finneman. Access will be open April 15-July 15, courtesy of Taylor & Francis. For audio, video, and text synopses of the articles, please see this page. The Suffrage and the Media team is also the force behind the database, SuffrageandtheMedia.org. The team members are comprised of Kroeger, Linda Lumsden, Linda Steiner, Jane Marcellus, Jane Rhodes, Jinx Broussard, Vanessa Murphree, Ford Risley, Maurine Beasley, and Kathy Forde Roberts. 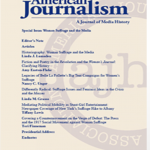 This special issue of American Journalism commemorates the centennial of the enfranchisement of women in the United States. The peer-reviewed original research here and the companion database at suffrageandthemedia.org culminate two years of robust effort from a dedicated team of journalism and communications historians. Women’s suffrage faced many arenas of challenge, but none more formidable than media. Key to the eventual triumph of the campaign after seven decades of struggle was its effective use of media in myriad forms, among them, publications, posters, postcards, and news releases to invite coverage of its parades, pageants, mass meetings, protests, and pseudo-events. Just as important, especially in the campaign’s final decade, was the editorial support the movement began to enjoy from popular mainstream newspapers and magazines. The special issue opens with a state-of-the-field essay on the suffrage movement and the media, followed by five new offerings to its canon. Deliberate, unconscious, and reflexive media messaging is the three-strand thread that bastes the five essays together. This emerges from the editorial choices of two major suffrage journals, in the suffrage coverage of three sympathetic small press magazines, and in the responses of mass circulation newspapers to the efforts, ideas, and actions of suffragists and anti-suffragists at two specific points. Linda J. Lumsden introduces the issue with her historiography of suffrage and the media research. She traces the scholarly research trends—and gaps—from the recovery efforts in the 1970s, through the cultural-historical and media coverage analyses in the 1980s, to intersectional approaches of black feminist scholars in the 1990s that challenged earlier accounts. As the century turned, scholars considered suffragists’ contributions to consumer culture and cast a critical eye on the visual rhetoric of spectacle in the form of parades and the White House pickets. By 2017, as the national centennial celebration commenced, three new books reflected on “the golden media effect” of elites with style, money, and celebrity-like appeal who became engaged with the movement in its final decade. Much suffrage media research has been piecemeal, Lumsden argues. She calls for fresh comprehensive examinations of how US suffrage print culture drew women into the public sphere and changed them both. Amy Easton-Flake begins to answer Lumsden’s call. She analyzes—in tandem for the first time—the literary works that appeared in the Revolution, the organ of the National Woman Suffrage Association, and the Women’s Journal, published by the American Woman Suffrage Association. Easton-Flake finds that the fiction and poems were an integral part of each journal’s polemics as the fiction and poems they published articulated and advocated their organization’s respective views of the new woman and the changes most needed for her advancement. Developing racialist themes more broadly, Linda M. Grasso takes on the “differently radical” approaches to the suffrage question of the NAACP’s the Crisis, under the leadership of W. E. B. Du Bois, and of the Massesunder editor Max Eastman. She underscores the “radicalized racialism” of the 1910s as manifested in these two magazines, one with a black readership, the other with a white one. They were as united in their support for women’s suffrage as they were divided by their distinct political imperatives. Grasso’s close look at the 1915 suffrage issues of both magazines illustrates their divergent perspectives on gender discrimination and disenfranchisement. Tiffany Lewis acknowledges that the welcome avalanche of mainstream press coverage of New York’s suffrage hikers indeed subverted aspects of the suffragists’ purpose. For as the women walked the 170 miles from New York City to Albany in December 1912, the press often mocked and made light of their trek. She further contends that by portraying their pilgrimage as a journey of “adventurous, determined, and emotional heroines of an action-packed serial,” the press managed to publicize, represent, and domesticate the meaning of the women’s public mobility in a way that made their activism seem less alarming and more intriguing. Finally, no new research on suffrage and the media would be complete without attention to the anti-suffragists, which Teri Finneman provides with her work on local press coverage of the antis in the critical year of 1917, when their efforts neared defeat. Through the use of textual analysis and framing and social movement theory, Finneman’s essay enhances the literature on press portrayals of counter-movements. Short video summaries of these articles are included on the database website. In addition, the site contains scores of primary and secondary source entries, all filtered for easy retrieval by subject area, type of work, and era. The content is suitable for coursework assignment and use at every learning level, from middle schoolers to scholars to lifelong learners. We will continue to upload new additions throughout the suffrage centennial period. We thank the sponsors of this project, American Journalism and the American Journalism Historians Association, Humanities New York, New York University’s Faculty of Arts and Science and the NYU Arthur L. Carter Journalism Institute, Philip Merrill College of Journalism at the University of Maryland, and Temple University’s Klein College of Media and Communication. We salute the incomparable “Team SuffMedia” volunteers: Maurine Beasley, Jinx Broussard, Kathy Roberts Forde, Carolyn Kitch, Brooke Kroeger, Linda Lumsden, Jane Marcellus, Vanessa Murphree, Jane Rhodes, Ford Risley, and Linda Steiner. Their names are just as likely to appear in the footnotes to these essays and throughout the literature of women’s history as in this acknowledgment.